Madame Khokhlakov’s face suddenly acquired a look of extraordinary and morbid excitement. If I accused Part 2 to be largely devoid of plot, Part 3 more than makes up for it. 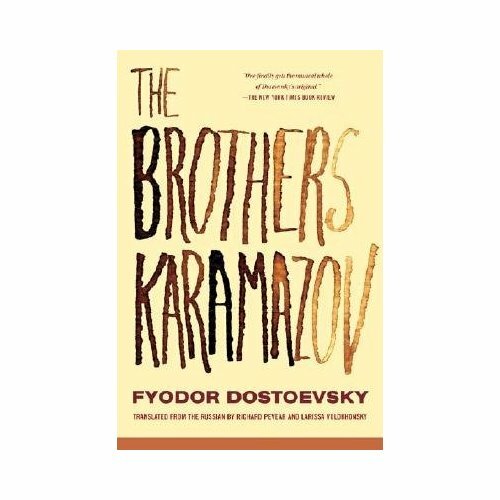 The pace is almost frenetic, as we go from the death of Alyosha’s cherished elder, Zosimov, to the death of the brothers’ father, Fyodor Pavlovich. Dmitri makes a mad dash to obtain money and catch up with his love, Grushenka. Breathlessly, we follow him as he leaves Katerina’s house, taking a brass pestle in his hand, and hides in the bushes outside of his father’s home certain that Grushenka is there. When he discovers she is not, he is overcome with hatred for his father. What has Dmitri done? We know not, as we follow him blindly to the official Pyotr Ilyich Perkhotin’s, where he buys back the pistols he had given for ten roubles, and orders an extravagant basket of sweets, fruit, pate and champagne to follow his troika to where Grushenka has apparently met with her former lover, Kalganov. It’s like a soap opera in its drama, and the best mystery you’ve ever read, and yet the horror of it strikes my very heart. Through Mitya we discover what it is to be on trial. When his clothes are stripped from him, for material evidence, he feels completely debased. When the questions come at him unceasingly, he must force himself to reveal his intentions no matter how private they may be. And, as a reader, I am completely unsure as to who actually did kill Fyodor. Was it Dmitri? He claims he did not. Was it Smerdykov? He was lying on the point of death after a night filled with seizures from his “falling sickness”. Was it another brother, or another villain whose goals we know little about? The suspense is killing me. I know not whom to trust. Could it really be true that Mitya is innocent of killing his father? Was it Smerdykov? He was lying on the point of death after a night filled with seizures from his “falling sickness”.Ah, but was he? After all, he told Ivan in Part II that that's exactly what would keep him in bed, unable to stop Dmitri from using the signals dishonestly…It's funny, one of the things in my post for today is that I think the book makes for a strange mystery, because I am totally certain Dmitri did not kill his father, and, though I didn't mention it, I am almost equally certain Smerdyakov did. Truly a frantic section. I can't wait to see what happens next! This will have to be a summer project. Either way, I'm still tuning in! Your chapter by chapter method of investigation is very helpful. To push the (precisely relevant) quotation a bi further: If, as Zosima claims, we are all guilty of everyone's sins, are all of the characters then guilty of Dmitri's crime, whatever it was? Is Dmitri guilty of everyone else's crime, regardless of what he actually did? "The pace is almost frenetic." Oh, yes! Moves so quickly that the whole of it can be digested in a day. Love how you play book temptress here in this post, drawing us in and through the action, and depositing us at the question.And then there are Amateur Reader's questions above (who has added great insights and comments to our shared read). I do feel this is shared guilt in Dostoevsky's view. But more on that next week when we wrap up. I think it would be a worthy summer project, and I hope these posts give you a bit of a foundation without giving too much away. Thanks for still reading what we have to say! I just had to keep going after I finished Part 3. I've finished the novel, now, and I want to be careful in what I leave in the way of comments so as not to spoil it for anyone, but yes, I agree with you: I couldn't wait to see what would happen next either! I have a hard time buying that I'm guilty for everyone's sins; I have enough of my own to bear! But, I do think that we have a sinful nature, and in that we share any guilt which is to be had. I can sympathize greatly with Dmitri's desire to be the 'fall guy' in that I see him wanting to make things better, or at least assuage his own blame in beating Grigory, hating his father, or any other sin he may have committed. Like a student, I shiver with delight when you say that you enjoy how I took you through the novel and deposited you at the question in the end. What a girl of affirmation I am, and I'm glad to play the part of book temptress as well!Amateur Reader has posed several exciting questions of his own, and been a wonderful asset to the shared read…I only wish we could all be in the living room together discussing face to face. Both of my book clubs refuse to read something so Russian, something so thick, and I crave the conversation over these kinds of novels.It will be lovely to have the wrap up post next week when we don't have to worry about leaving any spoilers for one another. As to those who haven't read it yet, they may have to exercise caution when visiting! I am so glad there was more action in this part! I finally got my post up and I can't wait to finish to see what happens! Lagging far behind as I am, you make me want to rush even faster to catch up. You're not "spoiling" either, but you are illuminating. The questions you ask really help. I could really feel Dimitri's vulnerability when he had to remove all of his clothes, and I thought the bit about him hated how his feet looked and how the one toenail curved under more than the other was a brilliant detail. I don't feel like it was Dmitri who did it, but I have mixed feelings about him because he wanted to. What should we be judged by, are intentions or our actions? What exactly did he grab the pestle for?It would be great to have a discussion on this book in person, but, like you, I don't know of anyone willing to try in my neck of the woods! Allie, the action continues through Part 4 with nary a let up; it's so exciting I can't wait to discuss the end next Thursday. I'm glad you feel as I did about Part 3. I didn't feel it was Dmitri,either, and lest I spoil the ending I can say no more about that here. You're wondering the same thing I am, though, is it fair to judge us be our intentions or our actions? I suppose if we had the answer to that we could solve the judicial system worldwide! I guess I feel that our intentions are just as wrong as our actions, it's with them that we first need to exercise self-discipline. Although, stopping oneself from what one longs to do certainly requires moral strength. I am so sorry for not posting this past week. I've had strep throat and have felt awful. I promise to finish in time for this week! Everyone's comments make me even more excited to keep going. No worries! I'm sorry that you were sick, and should you find time to finish it, I look forward to what your thoughts are. Feel better soon!